Sports Talk in the U.K. | Notes from the U.K.
Sports Talk in the U.K.
I’ve been the victim of sports talk recently. To sympathize properly, you have to understand that I have a sports allergy, and it’s severe. At singers night at the pub last week, K. was oblivious to my condition and talked—not to the world at large, but to me specifically—about the World Cup. The U.S. team, he said, was his idea of what a team should be. At this point, I plugged my ears to keep from breaking out in a rash, so I missed part of the conversation. Which wasn’t a conversation, both because I had nothing to contribute and because my ears were plugged. Still, I’d heard enough to wonder how a U.S. team could play world-class football. (And if you’re American, you have to understand here that football means soccer, not that game with the funny-shaped ball and the beefy guys running around in the modern-day equivalent of armour.) I mean, when I left the U.S., soccer never gave me a rash because I never heard about it. I’ve been gone for eight years now, but surely it takes longer than that for a sport to take hold of a culture and attract obscene amounts of money. Of course, K. might have been messing with me. It’s hard to tell with him. I took my fingers out of my ears long enough to hear him say that if the English team played well it would upset the natural order of the universe. So being an English football fan must be something you do to build character, not to enjoy yourself. I went home scratching my rash. But it hasn’t just been the World Cup. 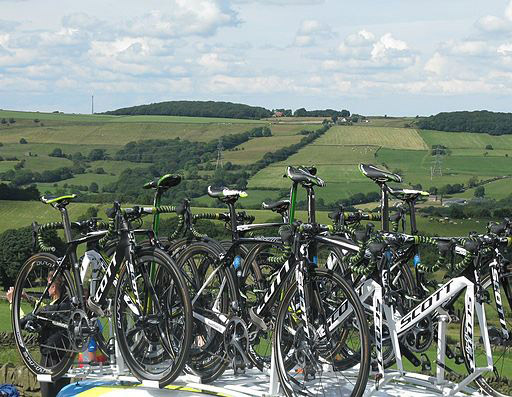 The Tour de France, for reasons I can’t explain, ended up in Yorkshire this year. Is this the Second Coming of the Norman Invasion, using bikes instead of horses? Did someone post the route wrong, tricking the riders into hundreds of miles of wrong turn? If so, how did they get the bikes get across the Channel? Whatever the explanation, swarms of bike riders zipped through the English countryside in a race with a French name. The Tour’s director suggested that close to 5 million people from Yorkshire had turned out to watch. If that’s true, it’s amazing, because the official population of Yorkshire is 5.3 million, and some of them surely had the flu, or a sports allergy serious enough to have kept them home. Fortunately, Yorkshire’s a long way from Cornwall, and if they ever hold the Tour de France here they’ll be hard-pressed to get 5 million out of our population of 532,000 lining to roads to watch. This entry was posted in Other Stuff and tagged Americans in Britain, Americans in England, anglophile, Tour de France, Tour de Yorkshire, World Cup by Ellen Hawley. Bookmark the permalink. Can confirm K wasn’t messing with you about the USA soccer team, although would agree it can be difficult to tell sometimes! A lot of Brits enjoyed how the USA team played in the World Cup and wondered with we could “adopt” them or do a swap with the England team!! The US pays so little attention to what it insists on calling soccer that not many people would notice if the UK adopted its team, or swapped teams, or beamed all the players up into a spaceship.